The high desert of Arizona is characterized by vast and expansive views, a rocky terrain, and sparse vegetation consisting of Scrub Oak, Pinion Pine and Juniper; here coyote and jackrabbit engage in the daily battle for survival. Abundance of sunshine is the norm with the average rainfall below 50mm per year. A typical well may dig 70m deep before striking an adequate supply of water. It was into this environment that architect Jeffrey Zucker was invited to design a private residence for a retired couple whose ultimate desire was to incorporate the outdoors as much as possible into their lifestyle while creating a casual, comfortable feeling within. Energy efficiency was a critical and personal concern to help keep the utility bills to a minimum while allowing the elderly couple to enjoy the home that they had envisioned for many years. The first step is an organic approach to the design. Be it a house, an office, a museum or a church, the design is a natural outgrowth of the needs and desires of the owner and the dictates of the site. 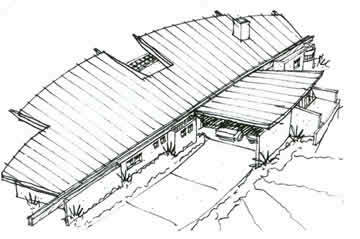 The design process for the McMillian House started with an in-depth meeting with the clients to determine not only the necessary physical attributes of the building, such as number of bedrooms, size of living room, etc., but also many less tangible items such as their lifestyle and their feelings and emotions. This can include how the couple feels about privacy, how they want their friends and neighbors to view them, and what an ideal ‘home’ means to them. The second step is to analyze the site. With a topographic survey in hand, such things as the path of the sun, the critical views, the valuable trees, and the vehicular approach are investigated. The site slopes gently down to the south with 180-degree views, including Granite Mountain in the distance. The first sketches of the project started out as mere scribbles resembling a cluster of circles and arrows developing into the organization of spaces (space planning) of the house. It became obvious during this phase of the design process that the house would be strung across the site in a linear fashion, allowing it to follow the contours of the land and enabling it to display itself to the south. The garage was positioned to the north side of the house, requiring little of the view or the sunshine. The slope to the north encouraged the house to snuggle into the earth, thus taking advantage of its cool temperatures in winter and relatively warm temperatures in the summers. When the schematic diagrams of the house reached a point of satisfaction for the clients, the next step was to envision the concept of the house. 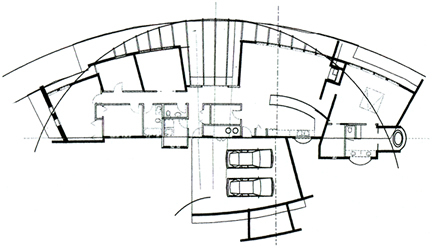 Quick, thumbnail sketches of the floor plan and the exterior of the building were developed with a myriad of ideas flowing onto paper and into the computer. As this process evolved, the house began to take on the shape of a leaf. This was no accident, nor was it a mere contrivance of the architect. The inspiration for this design came from the observation of a Ficus plant leaf. This leaf is essentially a folded plane shaped in a curve on the edges leading into a long, narrow point on the side opposite the stem. The water harvesting design of the roof allows rainfall to be retained for a period of time, to be metered out at a later date to the plants that need it. A building is like a living creature. It is an organic response to the environment and the people that live within it. If it functions well, its needs are minimised, and it lies softly on the earth like a leaf. When water lands on the leaf, it is naturally directed towards this end point where it proceeds to drip off. This was found to be a useful analogy for the roof that harvests the precious moisture squeezed out of the desert air. Rainfall is directed to a cistern at either end of the house and stored for later use. This is important because the typical precipitation during the summer occurs in torrential downpours, accompanied by severe lightning and thunder. While delightful to watch, the thunderstorms usually result in quick run off and flooding conditions for a short period of time with little of the valuable water remaining to irrigate the desert. The water harvesting design of the roof allows this rainfall to be retained for a period of time to be metered out at a later date to the plants that need it. Gravity is also enlisted in the scheme, forcing the water to flow downhill to the south side of the house. This, in turn, created an opportunity for deciduous trees to be nourished on the south side, providing much desired shade in summer while shedding their leaves in the winter to allow the sun to penetrate deep within the house. The cooling strategy of the house is further augmented by using the entire house as a huge evaporative cooler. As breezes travel up the hill from the south, they are funneled through a pair of sliding glass doors by the patio. This patio is covered by a metal trellis where vines are encouraged to grow to create a shady, cool environment. Air flows though this cool area and is drawn into the house simply by opening a few windows at the opposite end. A re-circulating water feature at the main entry further cools the house as the air passes by. The details and construction drawings of the house continue to address the conservation of water by providing a greywater system. Water from the hand sinks, showers and laundry is used twice by collecting it in a system of pipes below the floor slab that are separate from the sewage system for the toilet and kitchen sink. This water can then be stored and filtered before irrigating the landscape to the south. The concrete floor slab itself acts as a ‘cool sink’, or a storage mass for cool temperatures. During the summer months when temperatures can vary as much as forty degrees Fahrenheit between day and night, the windows are left open all evening long, allowing the slab to cool down. During the day, the coolness is trapped within the house by closing the windows, and the slab helps to moderate the temperature of the interior of the house for a good portion of the day. At sunset, when the temperature immediately drops due to the arid climate, the windows of the house are opened, and a whole house fan quickly draws fresh, cooler air throughout the house. During the months that heating is required, the slab stores heat from the sun that penetrates through the south facing glass. The slab is also warmed by a hydronic system of radiant heat from tubes embedded within it. This type of system provides an efficient and even heat source, creating a cozy and comfortable climate within the house.